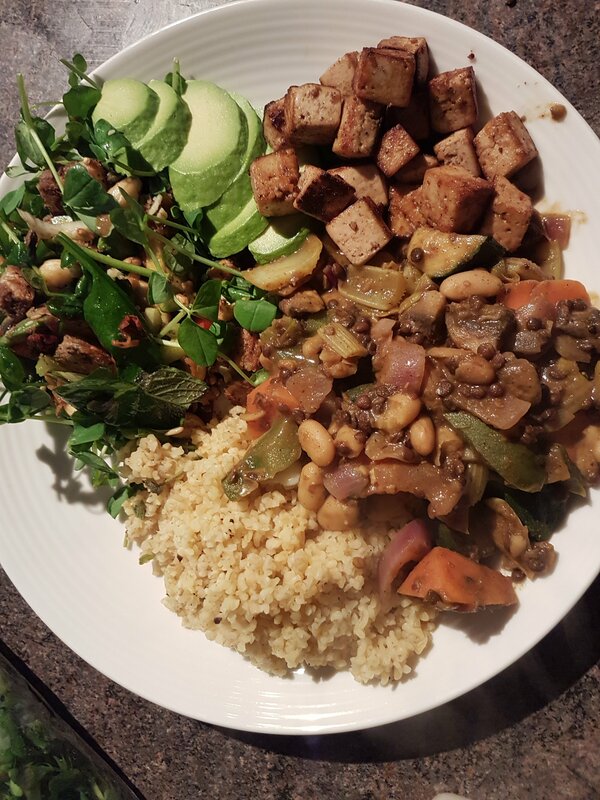 I just wanted to eat things that make my mouthwater but I have been lazy lately and sometimes you really need to remind yourself food is more then just eating and whilst I am not vegan I am always trying to expand my weekly choices to include these options. This is a Multi layered meal which you could do some of one day and then the rest just before you want to eat. Soak Mixed beans (black eyed beans, kidney beans, cannelli beans, bolotti beans) change water add stock, garlic, fresh rosemary, sage and leave overnight. Then fry veggies, onion, pepper, courgette, tomatoes add cooked beans with some chilli powder, cumin, coriander. And a create a sauce with water, tomato puree, marmite, and mustard. For the Bulgar wheat, once its boiled in water and abit of orange juice then add black olives and herbs. Apple and watercress salad with a paprika croutons is another excellent side to this.